Total Score: 8.67 - EDITORS CHOICE! Introduction: When the sun is high and your concentration is dedicated to coaxing that next big bite, protection from the sun’s UV rays are one of the last things to come to mind. For bass fishermen, there has been a move in recent years to bicycle jersey style tournament shirts, and while some of these shirts can have a built in protection from the sun, due to the style of these jerseys, one of the most susceptible areas on your body usually remains exposed and that’s your neck. 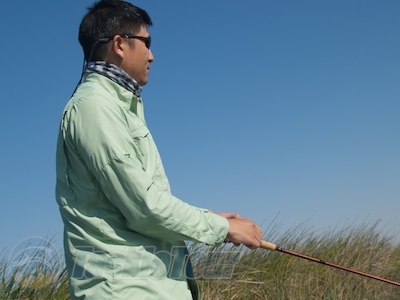 Wearing a long sleeve collared shirt offers better protection, but until recently, the options in this garment style, for a fishermen, were few and far between. The bicycle jersey style tourney shirts are nice, but they don't provide quite enough protection from the sun's harmful UV rays. Safari shirts, Florida flats shirts, were among the available options but these were either too heavy and thick (safari style shirts), or too difficult to find unless you were in a favorable geographical location. Thanks to the folks over at Under Armour, this is no longer the case. Introducing the Under Armour Flats Guide II Longsleeve fishing shirt. Impressions: Under Armour’s Flats Guide II Longsleeve shirt is a lightweight garment built with UPF 30 protective fibers designed to give you protection from the sun while keeping you cool and warm at the same time. Cool and warm at the same time? Did I say that right? A collared shirt, on the other hand, helps to protect your neck. Yes, thanks to this shirt’s synthetic fibers, the fabric wicks moisture away from your body to help keep you cool, yet at the same time, because it’s a long sleeve button up, provides protection from the wind to help keep you warm. Throw into the mix the full collar on this shirt and you get the benefit of maximum protection from the sun’s UV rays. Sounds like quite the remarkable garment but how does it all come together out on the water? Double it up with a UV buff and you get extra protection around the neck. We fished these shirts during the Summer of 2009 on a variety of tackle testing assignments and to be honest, I did not really notice any difference in comfort level between wearing one of these shirts and my TackleTour fishing jersey. Our TackleTour jerseys are not made from UV protective fabric either. 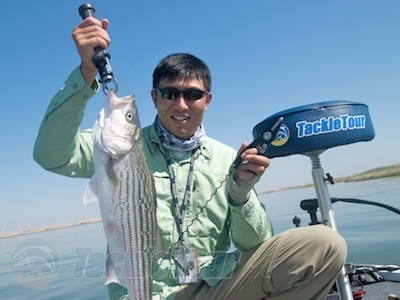 Button down, collared shirts are certainly less conspicuous out on the water too. Trouble is, as mentioned earlier, with the tournament style jerseys there is no protection whatsoever of the neck area so in order to protect this area from the sun I had to remember to apply sunblock regularly or risk getting burnt. Well, after getting burnt more often than not, I decided it was time for a different solution. Making it easy to go from the deck of your boat, to any number of places afterwards without having to swap shirts. Enter my search for a comfortable collared shirt to wear while fishing. Actually, this was a preference I had even before joining TackleTour but you’d be surprised how difficult it is to find a simple, white, button down shirt that’s lightweight and comfortable to wear out in the sun and doesn’t require an appointment with the iron before each fishing trip. 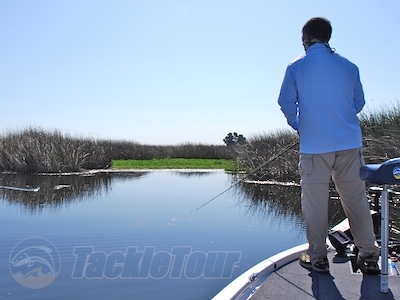 Under Armour has been making strong play to get into the fishing industry in recent years and when I discovered their Flats Guide shirt, I felt my long standing search for a comfortable fishing shirt might have been over. ... but not so with Under Armour's Flats Guide Shirt II that offers contemporary styling in a shirt made for outdoor activities. Style: One thing that always annoyed me with collared shirts designed for the outdoors was the styling of the two front pockets. How tired is that look of the traditional triangular patches? Under Armour updates this look with the use of a vertical zipper on the left side and a more subtle, rectangular flap over the pocket on the right side. The result is a much more contemporary look and style more befitting today’s bass fishing scene. How do you make a shirt especially for outdoors? How about concealed vents along the back?